Over the past two decades the internet has rapidly become an important medium to retrieve information, maintain social contacts, and to do online shopping. The latter has some important advantages over traditional shopping. Products are often cheaper on the internet, internet companies sell a wider collection of products and consumers can buy items whenever they like without leaving their homes. On the other hand, the current state of online shops still has two major disadvantages over `real' shops: Products are often much harder to find than in traditional shops and there are no salesmen to advise the customers. In this thesis, we address both these disadvantages. 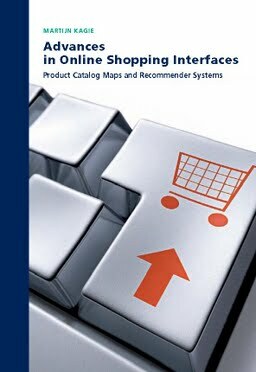 We introduce and evaluate several new user interfaces for online shops that are based on representing products in maps instead of lists to user, such that products are easier to find. In these maps similar products are located close to each other. To create these maps, statistical techniques such as multidimensional scaling are used. Furthermore, we combine these maps with recommender systems to address the second disadvantage and to help the user in finding the product best suiting her needs. Also, we introduce a recommender system that is able to explain the recommendations it gives to users. We think that the methods discussed in this thesis can form a basis for new promising online shopping interfaces both in research as in practice.